Members of Morris County’s anti-drug coalition, including NewBridge Services, came together Wednesday for the 2015 Countywide Prevention Forum. Attendees watched a trailer of the upcoming documentary, “Epidemic H,’’ which shines a light on the devastating toll heroin is taking on people throughout New Jersey. To save lives, the coalition is working to change attitudes and eliminate stigma surrounding heroin addiction and treatment. 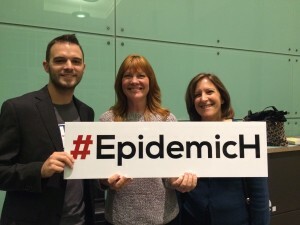 Pictured here are Mike Mee, executive producer of “Epidemic H”; Phyllis Minicuci, project coordinator for the nonprofit Morris County Prevention is Key; and Mary Vineis, NewBridge Services’ director of community response and education. The forum, held at the Morris Museum in Morris Township, was sponsored by the Community Coalition for a Safe and Healthy Morris and the Morris County Department of Human Services.